The process of picking up the threads of a project from 14 year ago, Faux Conceptual Art, is quite interesting. I’ve been framing the works, re-photographing them and creating new pieces. Looking at four works I see similar themes and ideas emerging. The pieces, Fibonacci Series With Calculators, Sit On, Price List and Not Here, have never been exhibited other than being presented on the web. This is a very strange idea. The whole web site, Faux Conceptual Art is a work that is a proposition. It is also in some measure a critique of the art market. Since re-engaging the works I am plodding along at a leisurely rate like a sort of anthropologist trying to piece together what I was thinking. This becomes fairly interesting because the world has changed, art discourse has advanced, and I have gone through many stages in that time. there’s an opening for an artist’s residency in Marseille, France at Peter Sinclair’s cap15 compound. It’s a large studio space around 1000 sq ft. The offer is for up to 6 months. The rental is 420 euros a month. It starts in September. Contact: (petesinc(AT)nujus.net). I called this piece 3-In-1 done in 1994, a fake Joseph Kosuth. Actually it was a restaging of the Kosuth piece that put the three separate elements (photo, chair, Photostat) into a frame making it into a single discreet art object. The original piece by Kosuth titled, One In Three Chairs has three separate parts. There’s a terrific discussion on http://post.thing.net concerning legacy conceptual art. Look though the comments section on the right. In particular Joseph Nechvatal and Blackhawk have been adding very incisive texts and commentary. 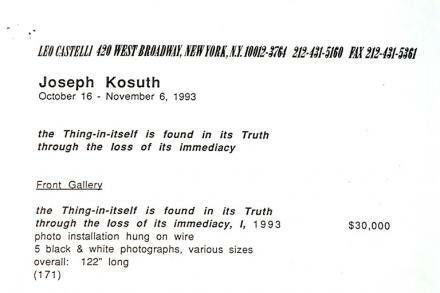 This work is a giant Xerox of the price list for Joseph Kosuth’s show at Leo Castelli Gallery in 1993. It’s a bit of an anthropological artifact. Leo Castelli is dead and the gallery is no longer open. 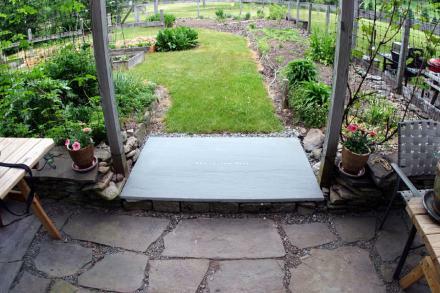 The piece is a system or a procedure or a set of instructions. The instructions are to draw a spiral on a board. Using four cheap calculators, create the Fibonacci series. 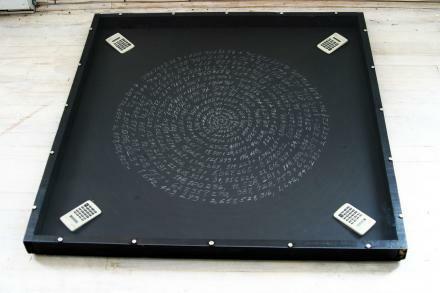 Write the numbers on the spiral as you go along. When the calculators can no longer calculate the numbers the piece is finished. It’s a closed system that is somewhat like the logical abstraction for a computer program, a set of instructions that is executed. It's interesting to see stuff from seven or eight years ago. Here's a group of streamed video interviews or "Relational Aesthetics" pieces I did at The Thing's former location on 26th street. You need a RealPlayer to see these.